We've been told that the best part of staying at Park Winters is the breakfast the next morning! And, while you can't replace the magic of starting your day in our little country oasis, you can at least recreate one of the decadent breakfast dishes we offer! Make the crème brûlée base: Heat cream to a simmer (don’t boil). In a large bowl, whisk the egg yolks, sugar, and vanilla together until incorporated. Next slowly add the hot cream a little at a time to the egg yolk and sugar mixture while whisking vigorously. Cut the challah bread into 1 ½ inch slices and soak both sides in the crème brûlée base until soaked all the way through. This is best done while the base is still warm, but not hot. Place the soaked bread onto a cookie sheet lined with parchment paper that has been sprayed with pan spray. Bake soaked bread for twenty minutes or until the custard is set. Refrigerate until ready to serve. Make the blackberry coulis: Heat the water, sugar, and lemon juice until the sugar dissolves. Cool the mixture in the refrigerator. In a blender add the cooled mixture to the blackberries and purée until smooth. Make the whipped cream: Add all ingredients to the bowl of a stand mixer with whisk attachment. Whip on a medium speed until the whipped cream holds under its own wait. Do not over-whip or the whipped cream will turn into butter. If you do not have a stand mixer, you can use a hand mixer, or whip it by hand with a whisk. Cook the French toast: Heat a pan on medium heat. Coat the one side of the French toast in sugar. Add butter to the pan, and as soon as it is melted, place the French toast onto the pan, sugar side down. Cook on the sugar side down until the edges start to get a little crispy. Flip the French toast and place in the 350 degree oven for 7 minutes or until it is warmed through. Place French toast on a place and garnish with the blackberry coulis, and the whipped cream. We are so blessed to be surrounded by such bounty - from a honey apiary down the road, to acres upon acres of walnut groves. This incredibly simple recipe, provided to us by our neighbors, PURE Honey, embodies our region in one sweet bite. Candied walnuts add a finishing touch on salads, compliment cheeses, or make for a perfect topping on ice cream! You really can't go wrong! In a medium sized bowl, mix together walnuts and honey. Spread walnuts evenly on parchment lined baking sheet, sprinkle with salt. Place in oven for 10-15 minutes (If you like crispy walnuts cook for 15 minutes). Let the walnuts cool before serving. As the days of Summer heat up, the elderberry tree at Park Winters becomes heavy with stunning deep blue clusters of fruit. The plump berries are harvested and pressed for their wonderfully sweet juice, which are then blended with high quality balsamic vinegar imported from Modena, Italy. 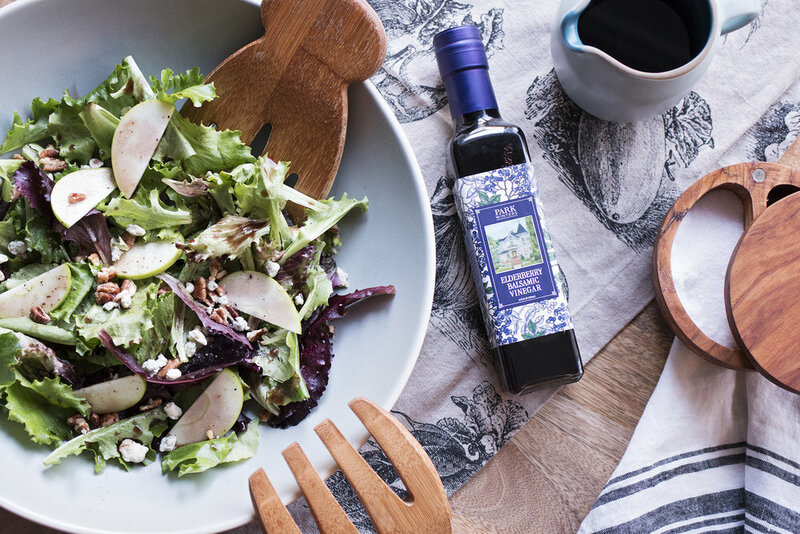 This unique balsamic makes for a lovely vinaigrette, perfect for a salad featuring fresh fruit, cheese and nuts. Pour olive oil into a medium-sized, round bottom bowl. Whisk in the Dijon mustard. Slowly whisk in the Elderberry Balsamic Vinegar, about ½ teaspoon at a time, until all the vinegar is fully incorporated and the mixture is fully emulsified. Add salt and pepper, adjust to taste. The tomatoes are thriving at the Farm at Park Winters, and we are already getting creative with ways to enjoy this Summer treat. One of our favorite techniques is to slow roast them in the oven at a low temperature, which maximizes their flavor in ways beyond your imagination! Preheat oven to 225°F. Halve each cherry tomato and arrange on a parchment-lined baking sheet. Smash the cloves or garlic and add to tomatoes, along with the fresh herbs. Drizzle with olive oil, just enough to coat the tomatoes. Bake the tomatoes in the oven for about 3 hours. The tomatoes should be shriveled and dry, with with a little juice left inside. This could take more or less time depending on the size of your tomatoes. Use them right away as a condiment on meat, grilled veggies or pastas. They're also great on their own as a snack! Just be careful to not eat the whole lot... it will be difficult! Our Father's Day BBQ was a hit last month... especially the grilled chicken, which was brined and then coated in chef John's unique Jamaican Jerk spice blend. He's had so many requests for the recipe, we thought we would share it with you all! We are head over heels for chef John's unique take on hummus - this one features nutty, vibrant pistachios instead of chickpeas. At Park Winters, we serve it with fresh seasonal veggies harvested daily from our farm, or earthy whole wheat bread from Uppercrust Bakery. Place pistachio nuts on parchment-lined sheet. Bake in the oven for 15-20 minutes, until light brown. While the nuts are in the oven, combine vinegar, tarragon, shallots and garlic in a small bowl. This will help to open up the flavors. Blend toasted pistachio nuts in the food processor until it has reached a fine crumble. Add in vinegar mixture, cumin and olive oil. Pulse until well combined. Add remaining ingredients, blend until smooth.